His feet were on the second slat of the fence, his knees against the top one, counterbalanced. 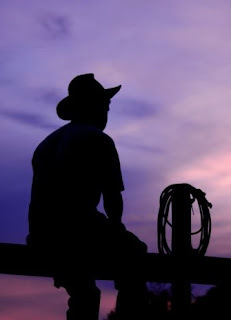 His hat framed the setting sun and he strained to see beyond the horizon. The earth began releasing the heat of the day and the birds woke up to begin an hour's worth of catching bugs for dinner. The baaing of sheep could be heard in the distance but that wasn't what he was listening for. Finally, he could make out the rhythmic sound of a horse galloping. The sun was obscured by dust, then the shape of a man. His own man.